One of the first to open at Capitol Piazza, Pho Tai is a family-owned Vietnamese restaurant located at B2. Originated in Paris more than 10 years ago, it is opened by a Vietnam-born Chinese family who moved there. Though the menu does not boost an extensive range of items, everything here is supposedly homemade. For example, the broth is freshly boiled with bones, meat and herbs for hours every day. Visited twice, both times for dinner on weekdays – ordered beef steak slices phô on my 1st and dry vermicelli (or bùn) with marinated pork during the 2nd. 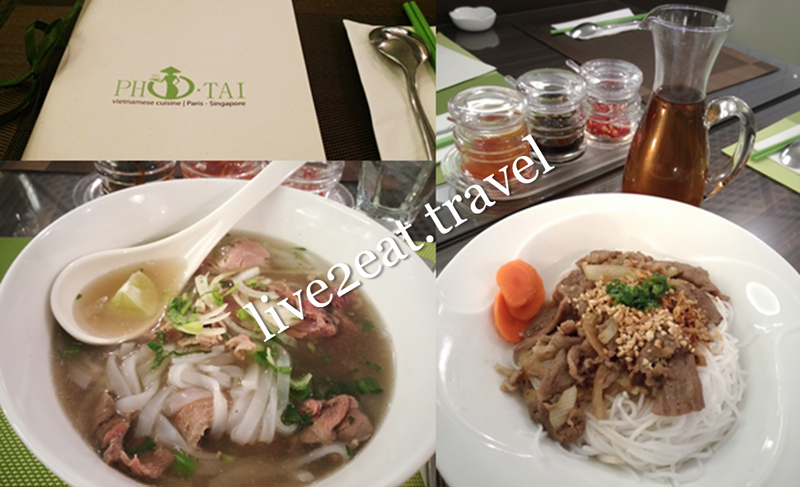 While the phô was silky smooth and herbal soup rich yet light, the tender beef slices tasted too gamely for my liking. The latter was served with a glass flask of flavourful fish sauce, atypical of commercially available ones, which accentuated the dish. I loved the aroma and crunch of crushed peanuts atop the well-marinated tender meat and springy vermicelli, reminiscent of local thick mee hoon in laksa.